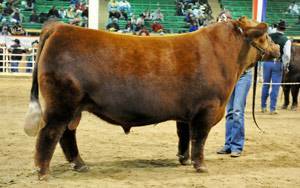 Majestic Lightning was the Grand Champion Bull at the 2009 National Western Stock Show and also the 2008 NAILE! The famous donor, Feddes Blockanna 807, the dominating Triple Crown Winner shows up on both sides of his unique pedigree. He's a must use sire for depth and correctness.